‘Suprabhatam’ is the first and the early morning seva that is performed at Tirupati. The Seva is performed at Sayana Mandapam inside the temple to wake up Lord Venkateshwara from his sleep. The TTD Suprabatha seva lasts for 30 minutes and is performed at the early hours of 3:00 am to 3:30 am. The reporting time for the puja is 2:00 am, though the pilgrims start to gather around 00:30 am onwards. The TTD officials would check the tickets at different points towards the way to the temple. It takes around 20 minutes to reach the temple from the assembly point. There is no queue for the temple as such and you would see people running towards the temple. People who reach the premises first would get the slot near the temple gate. The Puja is still performed by the Jeeyar heads of the temple. Every night after the last puja (Pavalimpu) is over the doors of the temple are locked and the key of the door is handled to the Jeeyar. The next morning the Jeeyar comes along with archarkars and the doors of the temple are opened in presence of Jeeyar. A the Yadava offers milk to Lord Srinivasa, even today, only Yadavas have the privilege to have the perumal’s Viswaroopa darsanam first. So the Darshan’s would be first given to the Yadava’s. Initially, the Jeeyar along with the pujaris recite Sri Venkateswara Suprabhatam which comprises of shlokas, verses etc. Soon after the recitation, the pujaris will enter the garbagriham, light deepams, and utsava vigraham is removed from the bed. After Suddhi, the curtain will be removed and the pilgrims can have day’s first darshan of Lord Vekateshwara. One other advantage is theertha prasadam will be offered to the people coming for darshan. 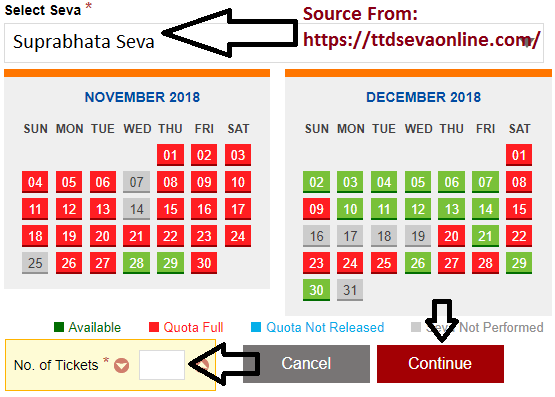 TTD Suprabatha Seva Tickets Online Booking are allowing every first Friday of the month. The TTD Suprabatha Seva is considered as very auspicious and since the tickets are very limited, the tickets gets sold very first. Thus for booking, the person needs to have a very good internet conditions. The first page that opens would have login details on the ride side of the page. If the person has signed up on the page before, he/she can simply enter the details and login else one can sign up and create their login credentials. After signing on the page another page will open which will have the details of the person listed at the top of the page and various services would be available on the right side of the page. 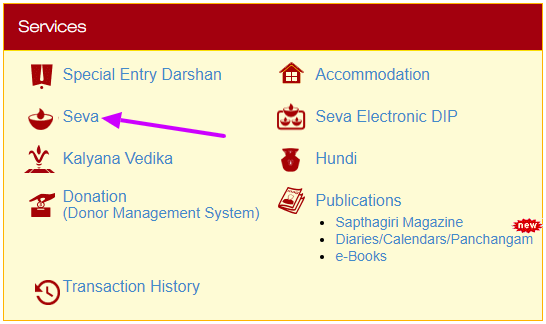 One needs to click on “Seva” on right side of the page. After this a form will open which will have the list of various sevas offered at Tirupati and date calendar. Some of the instruction points include: the assembly point for the seva, The things to be brought on the day while coming for the Seva and other instructions. After reading all the instructions carefully, one needs to make various selections like the seva one wants to part of, in this case it should be ‘Suprabhatham’. After clicking on ‘continue’, one on the next page one needs to provide the details of the pilgrims like name, age, gender, photo ID proof, Photo ID number etc. One also needs to enter the email ID and mobile number for contact purpose. At the top one should also check the details of the seva, date and time to see if the selections are made correct or not. After clicking on continue, the person would be diverted to the payment page. Here the person needs to check all the details provided. Once the user verifies the details he should go to the payment options which can be made via credit/debit card or net banking. The fee would be charged based on the number of people visiting for puja. After completing of the process, a reference ID would be assigned which should be kept for any future reference.One would also receive an email or a text message on the registered mobile number or email-ID. One should take an email for the same for future reference. I am trying to register both on Govinda App and ttdsevaonline to do further reservations/booking. But even after putting all details i m unable to register.